This delicious and nutritious pumpkin pie is made for those who love pumpkin pie all-year round. 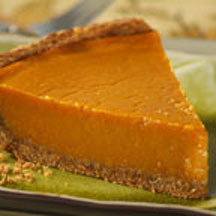 A lighter version of Libby's Famous Pumpkin Pie filling is complemented by the whole-grain pie crust featured in the best-selling book Superfoods Rx by Dr. Steven Pratt and Kathy Matthews. Now there is no excuse to wait until Thanksgiving to enjoy a slice of pumpkin pie. For Whole-Grain Pie Crust: Preheat oven to 350°F (175°C). Lightly grease 9-inch pie plate. Combine graham cracker crumbs, flour, oil, brown sugar, flaxseed, wheat germ, orange peel and ginger in medium bowl. Add egg; stir until moistened. Gently press mixture onto bottom and up side of prepared pie plate. Bake for 20 minutes or until crust is golden brown. Cool completely on wire rack. For Filling: Increase oven temperature to 425°F (220°C). Mix granulated sugar, cornstarch, cinnamon, ginger and salt in small bowl. Beat egg whites lightly in large bowl. Stir in pumpkin and sugar mixture. Gradually stir in evaporated milk. Pour into pie crust. Bake for 15 minutes. Reduce temperature to 350°F (175°C); bake for an additional 30 to 40 minutes or until knife inserted near center comes out clean. Cool on wire rack for 2 hours. Garnish with light whipped cream, if desired. Serve immediately or refrigerate.